following this link: Display Map With Compressors. When the map displays, you can narrow the viewing area by choosing a county or township from the tools to the right of the map, or double click within the map to zoom into a specific area. 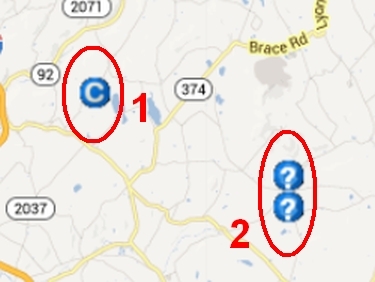 - The "C" icon represents compressor facilities whose location has been clearly identified (top example image at right, item 1). - The "?" icon represents compressor facilities whose township location has been identified, but the exact location within the township is unknown. We've placed these icons in the center of the township where the facility is located (top example image at right, item 2). When viewing the map, clicking on either icon will display a detailed report that includes the facility name, owner, address, county and township where the facility is located, and the facility ID (middle example image at right). Our expanded search tools also allow viewers to specify if the compressor icons will appear on the map (bottom example image at right). When the compressor box is checked, the icons will appear on the map. Note: including compressor icons on the map generally slows the map display down. For faster map interaction, you can uncheck the compressor box. Our compressor facility information is a "work in progress". 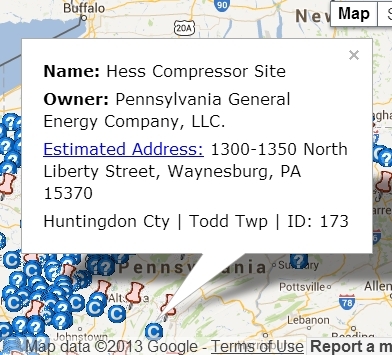 MarcellusGas.Org is unaware of any state source offering consistent and accurate compressor data. Our facility information has been gathered from a number of sources, and many compressor listings are based on anecdotal notes we receive from members. Our goal is to locate the facilities as accurately as possible. If you are aware of any errors in our listings, or know the location of compressor facilities that are not shown on our map, please let us know. 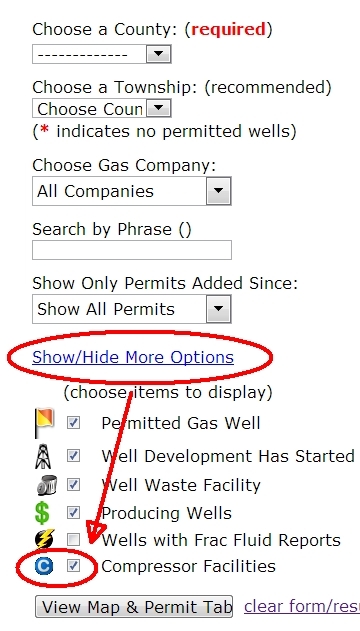 Click this link for a pop-up form, and help us accurately locate compressor facilities. Your efforts will be greatly appreciated.